Winner of a 1998 Deems Taylor Special Citation. Written, compiled and produced by Philip Blackburn. Second pressing. A full-length portrait of an unconventional life, Enclosure Three (ISBN: 0-9656569-0-X) is a luxury limited-edition 528-page, lavishly-illustrated, hardcover art-, bio-, scrapbook of Partch. It is the first biography of one of America's most original and influential artists told through over 1,000 facsimile documents in his own words: 330+ photos; essays; sketches; scores; correspondence with Anaïs Nin, W. B. Yeats, Edmund Dulac, John Cage, Lou Harrison, Martha Graham, Alwin Nikolais, Bruce Goff, Kenneth Anger, and Ben Johnston. Partch's life touched many of the central characters in American twentieth century art, literature, theater, architecture, film, dance and music. 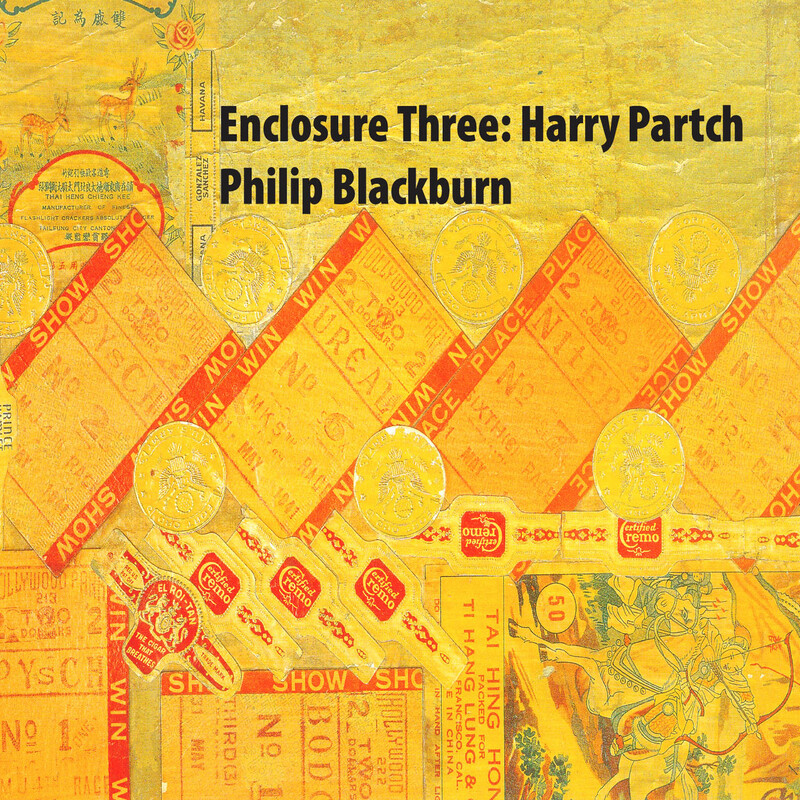 For Partch fans and neophytes alike, Enclosure Three contains essential source material for all those interested in unusual lives, Depression-era Americana, cultural history and creative educational approaches. Reading this text is like opening what you think is a bedroom door, only to find it leads to an entire mansion's worth of rooms. This volume's limited print run will make it difficult to peruse at your local bookstore, but I can guarantee that if you're interested in music -- or at a more general level, creative thought -- that questions the common and expected, you will become fascinated with the life and work of Harry Partch. Inside you will find, artfully assembled, a host of absorbing documents and fabulous photographs, facsimiles of the contents of a scrapbook. But this is no ordinary scrapbook - it is in effect a chronicle of the life of one of Music’s most extraordinary characters, as collected by the man himself. It brings you as close as you’re likely to get to this truly practical visionary, who is perhaps the greatest unsung hero of Music in the Twentieth Century. I am well aware that for once I haven’t voiced so much as a single complaint. The answer to that is as simple as it’s obvious. As far as I am concerned, Enclosure 3 is an unequivocally magnificent achievement, the jewel in the crown of the entire series of seven Enclosures. In bringing it to fruition, PB has done Partch – and, I presume accidentally, the collectors’ market! – an inestimable service. Enclosure 3, and for that matter the entire series of Enclosures, is a "must have" for anyone with an abiding interest in musical "alternative universes". Meadows note: This book is the twin-child of Bob Gilmore's biography; the two work in tandem as one to fill out a portrait of an artist in a more complete manner than may have been accomplished previously. To see Partch's words flow, year after year, as he struggles, nay, mud wrestles with his muse and his demons, is extraordinary. I have a small homage to Enclosure Three elsewhere on the site, but it is hard to do a work like this any justice at all. Of what will sure to be, at some point, legendary value. Philip Blackburn, in taking up the work of the original editor Kenneth Gaburo, describes this as "a scrapbook of a scrapbook" -- it's literally hundreds of pages of collages of Partch's writings, drawings, and musical scores, along with photographs of him and his instruments. Looking into the book is like entering a private dream. Even little scraps of paper with Partch's thoughts have been preserved here (including a little hymn of praise to the Library of Congress, reproduced on the copyright page). There is no effort made to interpret these or link them together ("helpfully") for the reader, so the effect is similar to having opened a trunk of memorabilia: one can construct one's own narrative, draw one's own conclusions. The endnotes are helpful for identifying figures in photographs and other materials. Blackburn's work on the book has been so meticulous that two fonts (one imitating Partch's handwriting, and one based on carbon copies of his 19! 54 typewriter) were designed to maintain the look of the originals even when material needed to be excerpted and retypeset. While the whole book is beautiful and engaging, my favorite parts are the reproductions of Harry's illustrated hobo diaries "Bitter Music" and "End Littoral." It's also the best collection of photos of the amazing Partch instruments I've found. Should be of interest not only to those with a love of experimental musics but also to those who maintain an interest in innovative genius of any kind. Partch tramped far and wide in his life, but this American Composers Forum reclamation project makes it clear that that limbo was one place he never strayed. What the newly available materials make clear is that though Partch's personal eccentricities may have been even more outrageous than anyone knew, his music is more subtle than most of us thought. Yet the best documentary portrait of Partch is not on film -- it's the new book Enclosure Three: Harry Partch, edited by Philip Blackburn. Partch kept scrapbooks all his life, and Enclosure Three is a sort of "scrapbook of scrapbooks," made up of letters, reviews, performance programs, lecture notes, personal photos, and even receipts. It's a crazy-quilt portrait of Partch's life. And what you learn, above all, is that Partch was not only eccentric, he was a bona fide crank. He hated everybody. He was far from isolated -- in fact he met and/or corresponded with a seemingly endless list of luminaries: Anais Nin, W.B. Yeats, Ezra Pound, John Cage, Lou Harrison, Martha Graham, Merce Cunningham, Kenneth Anger, Henry Miller, Virgil Thomson. But at some point, he alienated every single one of them. Here is an account, written by an eyewitness, of a typical encounter between Partch and poet W.H. Auden: "Auden said, 'Nonsense.' P. said 'Poop.' Auden said 'Pure nonsense.' P. said 'Pure poop.' It ended with Auden calling P. a despicable, mean man, and walking out." Not exactly a duel of glittering wit, but Partch reduced everyone to his preferred level of engagement. Thus despite his (surprisingly frequent) public successes, he led a bitter life. In an afterward, Blackburn reveals that in 1973, the composer was diagnosed with latent final-stage syphilis -- one symptom of which is the psychotic behavior he frequently exhibited. Blackburn cautions that we shouldn't turn Partch's life into "the biography of a spirochete," but this fact is one of the many indelible impressions one takes from Enclosure Three. Partch's behavior seems to have been as consistently terrible as his music was surprising and beautiful. This massive 500+ page book was first published in 1997 in a ltd ed of 1000 copies, 200 of which were signed by Blackburn, which quickly went out of print, currently commanding prices of nearly $900 - check Amazon and eBay - for a copy [the unsigned one, yet]. Thank heaven it's now been reprinted [a limited 2nd edition of 1000 copies] as 2005 comes to an end! A full-length portrait of an unconventional life, Enclosure Three is now a luxury [2nd edition of another 1000 copies] 528-page, lavishly-illustrated, hardcover art-, bio-, scrapbook of Partch. It is the first biography of one of America's most original and influential artists told through over 1,000 facsimile documents in his own words: 330+ photos; essays; sketches; scores; correspondence with AnaIs Nin, W. B. Yeats, Edmund Dulac, John Cage, Lou Harrison, Martha Graham, Alwin Nikolais, Bruce Goff, Kenneth Anger, and Ben Johnston. Harry Partch's life touched many of the central characters in American twentieth century art, literature, theater, architecture, film, dance and music.